Enabling a Digital Life...: What did IPL’12 give you? The year 2012 has so far been serendipitous for me. Yup…I have been seeing cricket matches since my growing up years only to question myself after every match, what did I gain out of it?…and went back every time with the same gusto to catch the next tournament on television, as if I did not hear the question! I broke this loop sometime back when I almost stopped following cricket. Came April 2012 when IPL 2012…the sporting and marketing extravaganza, started with the same zest as the previous four seasons. Depending upon what senses of sight and sound one followed, everyone had opinions and expectations from the tournament, with the same devotion as past seasons, whether it were marketing portals discussing at length about expected TVRs or the business press pondering about why a 10 second spot should be priced equal or lesser or higher than last year. Before committing my time to watch IPL 2012, I pro-actively asked myself, what’s in it for me. I asked, is the real estate of my brain worth keeping all those facts, statistics, schedules etc., when it does not generate anything in return, save for striking some small talk near the water cooler or in cafeteria? 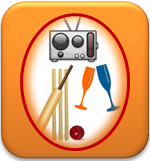 Well this year, IPL 2012 rubbed off its infinitesimal bounty on me vide the humblest of all media…yup the teeny weeny radio. No, I did not have to remember anything about the game. I just had to be myself and participate in contests that revolved around the game. The first contest I won was Super Six on 94.3FM Radio One. It was a simple concept. The listeners had to text SIX and if the SMS was sent in the over in which a six was hit, the listeners would win goodies. I won twice on this contest. The first time around it was a wrist watch and the second time around it was the party passes. (More on this in my earlier post 15 Minutes of Fame…Reloaded!). Second time around, lady luck turned the dial to 104FM Fever on the segment, Fever Flashback hosted by RJ Rubina. Rubina, gave an invitation to all 104FM listeners to catch the finals of IPL 2012 at Amoeba Sports Bar on a large screen and have dinner with 104FM Fever RJs, but but but...the listeners had to give a compelling reason on why they should be given this chance. The following words did the magic for me and there I was at Amoeba on 27th May 2012 with my better half. At the venue we learned that there were other 4 listeners who weaved a similar magic with their words on the station RJ J. We were joined by RJ Rubina and RJ Danish from 104FM Fever. In between the chat, photo clicks and munchies…we rooted and hooted for our favorite teams and were also heard on-air when Rubina linked to the station from Amoeba. It is something to read about and follow the RJs (or Radio Stars as Paul Chantler called them in the guest post Growing the Pizzazz) on Facebook and Twitter and a totally different experience to have a face to face interaction. You get to know them as a person, their likes and dislikes (not the facebook kind), what motivates them each day, what are their challenges, etc. Net-net, it was a great contest gratification. Opportunities such as these help stations build equity and loyalty amongst its listeners and most important, get to know, who is listening them? We found 104FM Fever Radio Stars disposition quite humble and grounded and to borrow from the famous MasterCard ad…Drinks and Food @ Amoeba…INR XYZ.00/- …to sit, drink, eat and click pictures next to Radio Stars whose voices reach over a million listeners each day! PRICELESS..!!! You are a lucky man! The only thing that the IPL gave me is a few inches of extra flab around my tummy.